With over two years as industry leaders in Colorado, our free online marketplace is proud to have users representing over 75% of the licenses in Colorado’s legal marijuana market. Today, our reach extends over 2,000 licenses and even more points of contacts in licensed marijuana grows, processors, and retail centers. Activate your free Cannabase Marketplace wholesale account to start creating free listings & requests today. Hands-Off Wholesale is the exclusive brokerage service of the Cannabase Marketplace wholesale network. As the largest wholesale marketplace in the state, we have buyers available if you’re looking to move product quickly and efficiently, and we’ll keep things simple by arranging delivery and logistics for both parties. For sellers looking to push product, there’s a sales fee of $75/lb for product that is successfully moved, but, of course, you only pay once the deal is done. Please note that utilizing the listings and requests in the Marketplace is still completely free to use. You only pay if you'd like additional brokerage or logistical services outside of the app. Please feel free to email us at sales@cannabase.io with any questions or to discuss the right set up for your business! Featured Listing Tags: Stay stuck to the top of listing index & maximize your exposure in the industry-leading wholesale marketplace! "Since before Cannabase was a recognized name in the industry, they have always been an ace in our pocket." 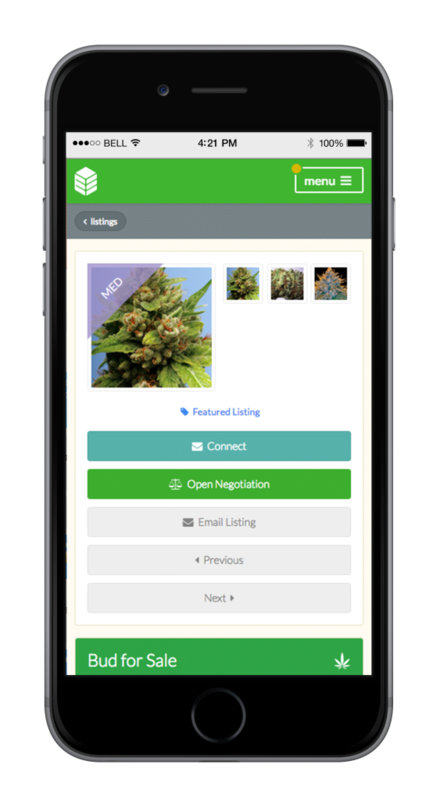 To activate a premium subscription (or a la carte premium wholesale add on), log into your free Cannabase Marketplace account and click the shopping cart icon in the upper right hand corner of your screen.